Trattoria La Gondola at the Kempinski Hotel Beijing Lufthansa Center in Beijing, China features authentic Italian cuisine. Enter the lively Trattoria La Gondola to the music of two guitarists playing in the restaurant with enticing aromas of garlic and fresh bread wafting in the air, and if you close your eyes you feel like you are somewhere in Italy instead of in the city center of Beijing, China. 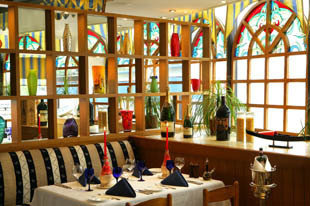 The atmosphere of Trattoria La Gondola is friendly and casual, and the service is excellent. Tables are draped with white tablecloths and are decorated with cerulean blue napkins, red candles set in wine bottles, and double decanters of olive oil and balsamic vinegar. There are comfortable striped banquettes along the walls, wood chairs, Italian paintings on the walls, live plants, and colorful Italian pottery displayed on the shelves adding to the overall charm of the restaurant. Edward F. Nesta and I stayed at the Kempinski Hotel Beijing Lufthansa Center in October 2006 and had dinner at Trattoria La Gondola where we began our Italian culinary journey in China. The restaurant offers an outstanding menu of pizzas, homemade pasta, fresh seafood dishes, and more, by Chef Francesco Alberti who brings a taste of Italy to Beijing. Our server brought us a basket of fresh assorted rolls and bread, which we dipped in olive oil and enjoyed while we waited for our first course to arrive. 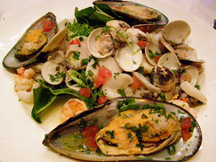 For his first course, Edward selected the cold seafood plate, which was a lovely assortment of mussels, cockles, squid, and scallops on a bed of mixed baby greens with diced fresh ripe tomatoes and fresh chopped herbs. I selected the Zuppa di Zucca con Amaretti, a creamy pumpkin soup served in a large deep white bowl with crumbled amaretti placed in the center of the bowl, which provided a contrasting sweetness to the pumpkin, as well as adding interest and texture to the velvety soup. For his second course, Edward decided to continue with seafood, and selected the Misto di Pesce La Gondola, which was an abundant array of seasonal seafood that included grilled salmon, grilled swordfish, shrimp, scallops, squid, and mussels. I selected the homemade Raviolini farciti con melanzane, which were small, tender ravioli filled with a savory mixture of eggplant in a buttery sauce, and were crowned with a delicious layer of sun-dried tomatoes and sprinkled with fresh chopped herbs and grated Parmesan cheese. We may have been in China, but the taste was pure Italian. Mangia! Read the other articles on the Kempinski Hotel Beijing Lufthansa Center in the Hotels and Resorts, Restaurants, and Chefs Recipes sections. Read other articles on Beijing, China in the Destinations, Hotels and Resorts, Restaurants, Chefs' Recipes, Spas, and Adventures sections. © January 2007 Luxury Experience www.LuxuryExperience.com All rights reserved.